The Ruelco pneumatic tattletale is a unique device to provide indication when production control or safety system sensors and control devices trip. The tattletale is designed to be installed in the exhaust port of pneumatic control devices and sensors. When these sensors or control devices trip, the pneumatic pressure venting through the exhaust port will cause the cap of the tattletale to pop up. This exposes a red indicator band, giving visual indication that the device has tripped. First-out indication of several sensors can be obtained by using the tattletale in conjunction with a pneumatic relay. Often this eliminates the need for an expensive control panel. 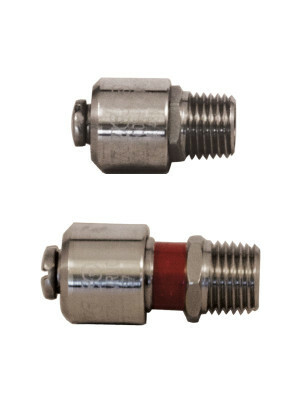 Now available in 1/8″ and 1/4″ NPT sizes.